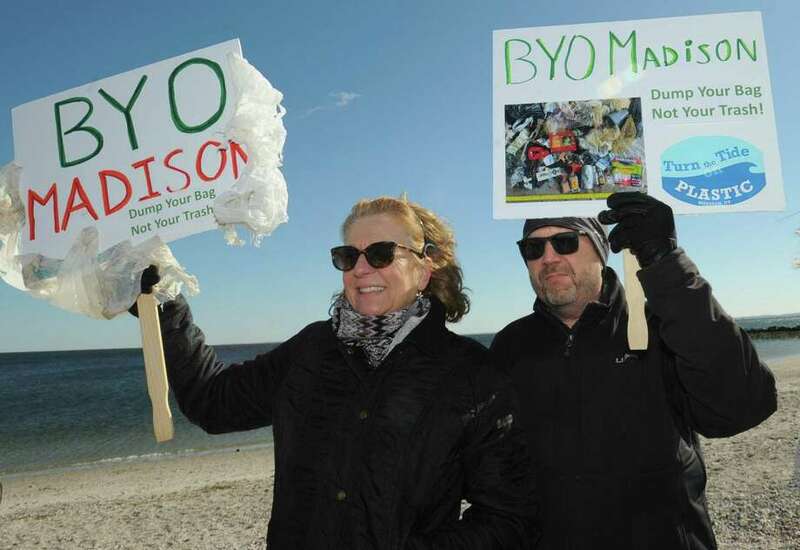 Kellie Brady and her husband Francis Brady of Madison listen to State Sen. Will Haskel and State Rep. Jonathan Steinberg tout a bill that would ban single-use plastic bags in CT Saturday, February 9, 2019, at Compo Beach in Westport, Conn.
FAIRFIELD — The fourth time might just be the charm for a plastic bag ban in town. “With this reusable checkout bag ordinance, Fairfield would join a growing group of leading Connecticut municipalities,” a March 11 memo to the Representative Town Meeting from District 3 member Heather Dean and District 7’s Jill Vergara read. The ordinance details enforcement measures, delegated to the Health Department, such as a written warning for the first violation, followed by a $150 fee on a second violation. Subsequent violations would incur a fee of $250. “When it was originally proposed to our office, there was going to be an education outreach component to local businesses making them aware of the change and a time granted to go through current supplies and order new compliant bags,” Health Department Director Sands Cleary said. The ordinance, if approved, would go into effect Feb. 1 of next year in order to allow local establishments to adjust for the change. Once the ordinance goes into effect, the Health Department would be in charge of responding to any complaints of establishments not in compliance, Sands noted. According to RTM Moderator Phil Pires, the legislative body will discuss the ordinance at the April 22 and 29 meetings. Sponsors of the proposal will present to the full body at the April 22 meeting. “Public comment will be received at the April 29 and May 28 meetings,” Pires said. Next month, the RTM will discuss the proposed ordinances on May 20 and 28. The ordinance is expected to go up for a vote at the May 28 meeting. There is bipartisan support for the measure within the RTM. Republican Minority Leader Pamela Iacono said she was in support of the ordinance and voted the proposed legislation out of committee. This proposal comes to Fairfield’s legislative body at the same time Hartford is mulling over a similar, but statewide, ban. On March 25, the legislature’s Environment Committee passed legislation that would essentially do away with single-use plastic bags starting January of next year. State law banning single-use plastic prevent would not impede municipalities from enacting their own with even more stringent regulation. Additionally, like the Fairfield proposal, the state-level legislature would push for stores issuing paper bags to be 100 percent recyclable and contain 40 percent recycled material. The only state to have successfully banned single-use plastic is California. Westport was the first town east of the Mississippi River to ban plastic bags over 10 years ago. In recent months, a slew of towns have passed their own bans on single-use plastic. These include New Canaan, Hamden, Greenwich, Stamford and Norwalk.